Looking at the history of our planet, we will find that scientists agree Earth is around 4.6 BILLION years old. 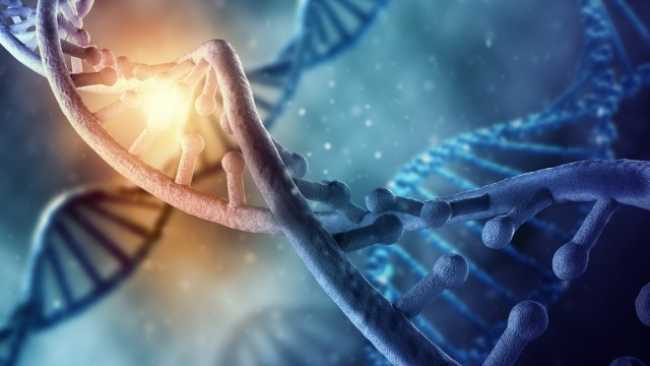 However, recent findings have given rise to numerous theories which suggest that our planet, and life on it –not just single cell organims— may have called Earth home even before modern humans appeared. Scientists have discovered carbon-laced crystals which are up to 300 million years older than the previously considered ‘oldest life on Earth’, which go back around 4.5 millions of years. Even though these crystals are not proof of the existence of biological life, they indicate the presence of chemical signs of life. A team of geochemists at the University of California at Los Angeles (UCLA) have just found evidence that there was life on Earth 4,100 million years ago. The finding implies that life came into existence very soon after our world was formed, 4.554 million years ago. The work was recently published in Proceedings of the National Academy of Sciences (PNAS). Another study–of great interest—was published in the Proceedings of the National Academy of Sciences, as lead author Michael Kipp, a UW doctoral student in Earth and space sciences, analyzed isotopic ratios of the element selenium in sedimentary rocks in order to measure the presence of oxygen in Earth’s atmosphere between 2 and 2.4 billion years ago. The findings are extremely interesting. Basically, scientists used selenium in sedimentary rocks as a tool to measure oxygen levels in our planet’s atmosphere up to 2.4 billion years ago. The study offered new evidence on how selenium had been changed by the presence of oxygen and even affected the appearance and DISAPPEARANCE of COMPLEX life forms. The results show that there was enough oxygen for complex life cells to develop. Referred to as pseudoscience, conspiracy or other names along that line, numerous discoveries point to the possibility that life may have flourished on Earth thousands if not millions of years ago. Giant footprints scattered around the globe suggest that in the distant past, before written history, beings of freakishly large proportions may have roamed the earth. If we look at ancient writings from South America, North America, Europe and Asia, we will find that ancient cultures mentioned giants in their ancient writings. However, some ancient texts not only mention giants but suggest they were real. One of the most controversial footprints was found in Africa, in the vicinity of the town of Mpaluzi, close to the border with Swaziland. The granite block where the massive footprint is located on is believed to date back between 200 Million and 3 billion years. 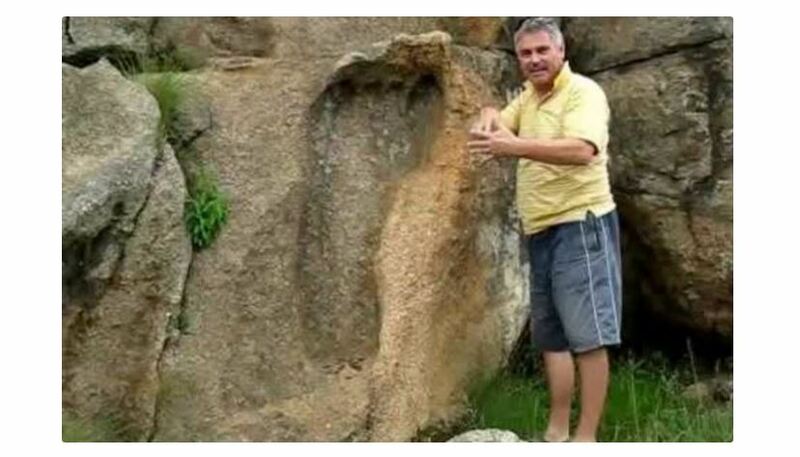 This fascinating footprint was discovered over a hundred years ago when a hunter called Stoffel Coetzee stumbled across it in 1912 while hunting in the area. Due to the fact that the footprint is located in an extremely isolated and remote region of the African continent, the chances of the footprint being a carved hoax are extremely low. One of the possibilities is that we are looking at an actual footprint, left behind by giant beings millions of years ago when our planet was much different than it is today. The other possibility, highly unlikely according to many, is that the massive footprint is the result of natural erosions and that a phenomenon called pareidolia is making us see a familiar shape, which in this case is a footprint. Recently, photographers exploring an area near a Chinese village came across a sensational finding. They discovered (and photographed) a footprint left behind by a massive being. In the image –see below— you can clearly see the footprint embedded in rock. Compared to an ordinary foot of a human being, the footprint embedded into rock is at least twice as big. 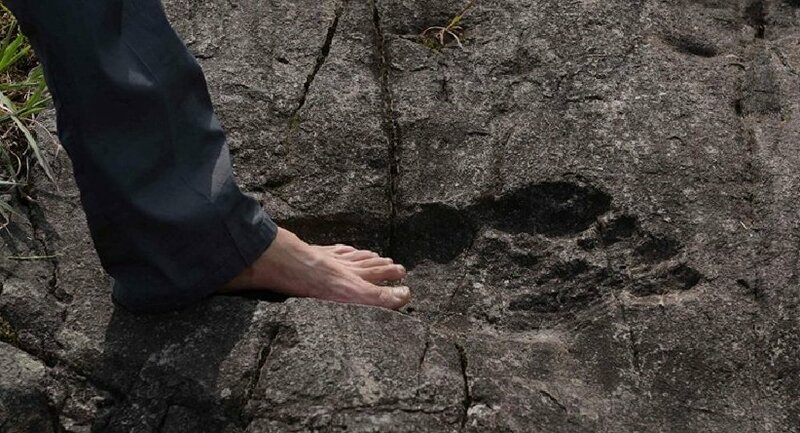 A footprint which dates back nearly 300 million years. Impossible right? The discovery of the 290 million-year-old footprint was made in New Mexico by paleontologist Jerry MacDonald in 1987. The discovery of the human impression has left MacDonald particularly puzzled and not he or anyone who has seen and studied the impression has not been able to explain how this modern footprint could have been located in the Permian strata, which according to scholars dates from 290 to 248 million years, a time period which occurred long before man or even birds and dinosaurs existed on this planet. Furthermore, artifacts which date back millions of years have been discovered scattered across the globe. One of them is a controversial artifact discovered in 1889 near Nampa, southwest Idaho when workers were drilling, searching for water. The small figure, skillfully formed in clay has since remained one of the greatest mysteries creating both confusion and amazement among scholars. Researchers have stated it dates back around 2 MILLION years.